The Orinoco delta can be divided in three parts: the main exit running West to East, the former secondary exit, Caño Manamo, running South to North, now significantly blocked, and the area in between. If all share climate and soil similarities there are still differences, in particular when Caño Manamo is considered. Caño Manamo used to be a secondary mouth of the Orinoco, its rhythms of flooding following the Orinoco, but the construction of a dike to link Tucupita to the mainland all but clogged the fresh water flow of the Orinoco, now all going through the main maritime channel in the South East. Caño Manamo is now marginally fed by the Orinoco and some lesser rivers out of Monagas. Considering the strong tide effect from the Atlantic this has resulted in a salinization of water deeper inside the North West corner of the Delta, with the concurrent salinization of potential agricultural land, and wildlife changes. On the other hand the semi flood control set up upstream the Manamo has also allowed for an expansion of agricultural lands and increased settlement. Still, this area which is the one I visited, posses loads of wild life and spectacular scenery in spite of the human pressure now visible the closer to Boca de Uracoa you get, the only real landing between Tucupita and Pedernales. Caño Manamo used to be a main penetration way half a century ago. After all, the main mouth was more treacherous, too big perhaps whereas the Manamo was somewhat more accessible. The discovery of some oil resources earlier last century resulted in the growth of Tucupita into a small boom town while the Caño Manamo was duly marked for navigation. From this busy past where small merchant boats could go up to load in oil and wood there is only one remaining marker, which should be declared a national monument. Right now it sits lonely, forgotten even by the locals who do not seem to recall this not so distant past. Yet, when you see its size and the quality of the make that allowed it to survive the rather harsh conditions you cannot help yourself but dream of the days when small steamers sailed the Manamo. Today only fast motor boats and piraguas sometimes with odd 50HP motors are the ones sailing by. Water indeed rules even if the Orinoco does not flow freely around there anymore. The last solid construction you see before you sail is a now rather decrepit landing at Boca de Uracoa. This is truly an end of the road village, where the only food available for tourists waiting for their ride is a grease spoon joint which rich smells scared away the semi vegetarian that I have become. On a Sunday the activity seems limited to the tourists dropped off by their ride and waiting for their boat ride. 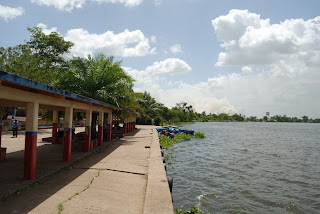 From the start the humidity hits you as you watch the already large secondary arm of the Manamo in front of you as the tide current carries the green floating islands formed by the bora (water hyacinths). The pier at Boca de Uracoa is truly an ending. 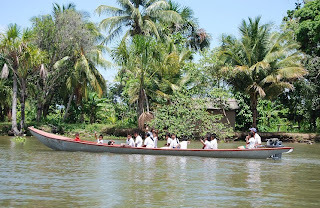 From then on transport will be through boats or piraguas which even serve as school boat, carrying cheerful children in white uniforms. All your traveling will be done sitting down under an inclement sun, as rare is the boat who has a cover of sorts. All are designed for speed, the only real recourse against the heat and the sun. No more AC, from now on SPF 30, liberally applied, and bug repellent when needed. 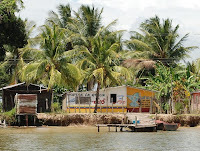 You even need to go by boat to your nearest grocery store such as this “bodega” with outhouse included on the river. Though the bodega is not necessarily the most visited corner of the river. It seems that most people are still close from the “hunter gatherer” condition even if some can afford a motor on their piragua. 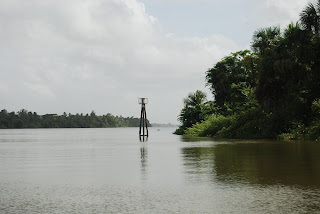 The river gives all, even the vegetation which lives off and for the river. When you live on a stilt house, watching the bora float by according to the tide rhythms, I suppose that you can satisfy yourself with a simple life style and simple goodies. Indeed, the alluvial land must contain significant riches, when not water logged. The traditional conuco agriculture is still easy to find even if sometime the conucos are hidden by the river bank dense vegetation. The technique has not changed much. Trees are fallen but not really removed. The land has to be rich enough for the natives to satisfy themselves with the little bit of corn or tubers that grow in between the dead tree trunks. Maybe their long decay serves as a fertilizer of sorts? But the conuco is not the only form of agriculture as more large scale forms are advancing from neighboring Monagas. I was impressed at how often I saw huge billowing smoke columns rising from deeper inland areas, and sometime not that deeper as the boat passengers suffocate briefly while crossing the smoke clouds drifting over the water. Humans advance and are slowly taking the drier areas of the delta. 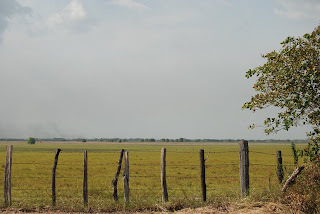 Already cattle and huge pastures can be seen close to Boca de Uracoa, probably the main activity for a while until someone decides to try its luck at rice. Global food scarcity make this prospect a short term thing. I can already guess that the upper delta is doomed. Where are the deforestation permits? In my 4 days I never saw a national guard, a policeman, a ranger, nothing. Meanwhile river traffic flowed, and new smoke columns arose. Eventually the upper delta will start resembling the Monagas flat land that you see on the road between Maturin and Boca de Uracoa. Temblador, the only thing vaguely resembling a town in between is a rather non descript place, also with an end of the world feel that is only alleviated by a strangely cheerful church. 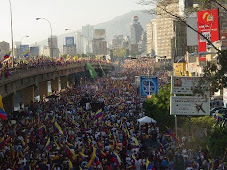 Yet, even at Temblador we already see the scourge of Venezuelan urbanism: the dreaded “invasion”. Temblador is not spared from the population growth without a parallel growth in personal opportunities. 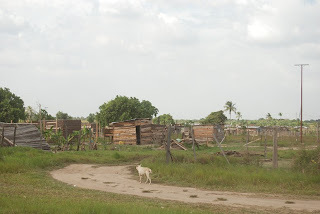 Temblador is far from everything and thus its unoccupied folks cannot even leave to invade Maturin idle lands. Instead they build a shack outside or end up as the two drunkards passing out under the precious shade of the Church door. But the drunkards at the church steps are not the only primitive behavior. All is primitive still, even before reaching the Delta, and even in spite the Direct TV antennas now spotting the few Warao villages blessed with electricity. But could it be otherwise when faced with the Southern Monagas emptiness, where even the hand of the governmental INTI land seizure system does not seem to quite reach yet? 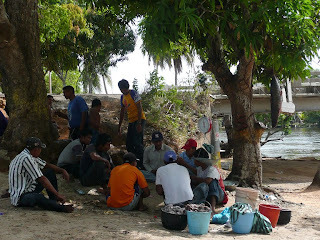 Thus how can I fail to be surprised when stopping to visit Rio Morichal Largo, a tributary of Caño Manamo I saw on a Wednesday afternoon this strangest of fish markets by the Rio? A spot on the road which by the way serves as beach for the locals on week ends and as a cooling spot on week days for weary truckers lacking an AC in their cabin. Nothing has really changed here in 50 years, at least since the first path crossed that shallower river area. The natives now wear baseball caps in lieu of their straw hat protection. Oddities are never in short supply, even if all looks the same at times. 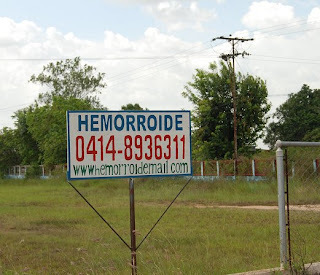 Even medicine evolves there and tries to reach out the crowds with this crudest of road side advertisement listing a mobile phone numbers. Yes, mobile phone reaches Boca de Uracoa even if it does not reach anything else in the Delta outside of Pedernales and Tucupita. It is a strange feeling to see modern technology to look already so old in its quick integration to the down to earth simplicity of Temblador natives. Click on photos for more detail. This is the second in a series of post. The introduction can be read here. At least two more posts will come in the next few days. The picture of the fish market was not taken by me, but by SDC, my traveling companion. Other of her pictures will be shown on occasion as we traveled together depending on who was fast enough to catch a given scene.